German physician and medical author; born at Regensburg July 11, 1807; died at Erlangen March 10, 1850. He was one of the pioneers of the modern school of medicine in Germany, and numbered Professor Virchow among his pupils. Canstatt studied at the University of Vienna and, later, under Schönlein at Würzburg, where in 1831 he obtained his doctor's degree. A year later he went to Paris to study Asiatic cholera, then epidemic in the French capital. His monograph on this disease, published the same year, attracted the attention of the Belgian government, which commissioned him to plan a cholera hospital. He remained in Brussels until 1838, when he returned to Regensburg to practise ophthalmology, in which he had won signal success in Belgium. The same year he was appointed official physician to the provincial law court at Ansbach, where he remained until 1843. On the death of Hencke (1843) he was called to the University of Erlangen to fill the chair of pathology. Three years later he was attacked by tuberculosis, and thinking that a change of air would benefit him, he went to Pisa, Italy; but he remained there for a short time only, and on his return to Erlangen he died. 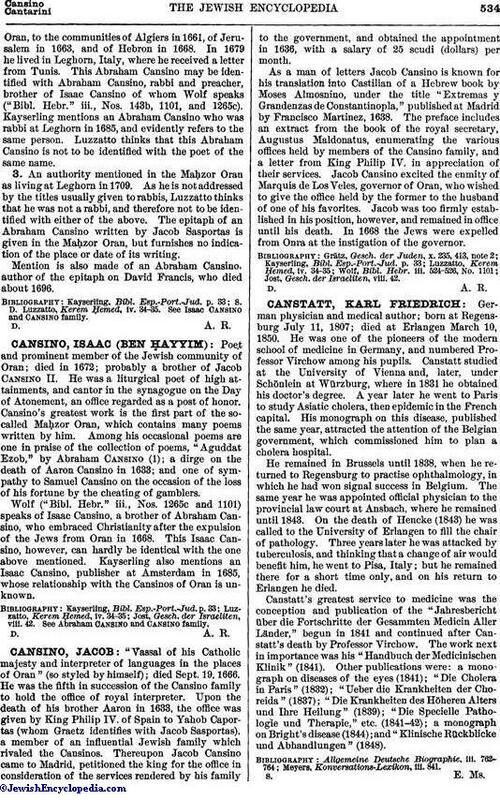 Canstatt's greatest service to medicine was the conception and publication of the "Jahresbericht über die Fortschritte der Gesammten Medicin Aller Länder," begun in 1841 and continued after Canstatt's death by Professor Virchow. The work next in importance was his "Handbuch der Medicinischen Klinik" (1841). Other publications were: a monograph on diseases of the eyes (1841); "Die Cholera in Paris" (1832); "Ueber die Krankheiten der Choreida" (1837); "Die Krankheiten des Höheren Alters und Ihre Heilung" (1839); "Die Specielle Pathologie und Therapie," etc. (1841-42); a monograph on Bright's disease (1844); and "Klinische Rückblicke und Abhandlungen" (1848).